Want to see a trailer for a nice game about nice things? Hopefully this one, for InnerSpace, can fit the bill. It's an exploration-based adventure that, rather than the traditional focus on ambulation, is instead about flying through a pretty, inverted world. 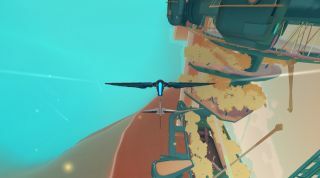 "Set in a world where physics are inverted," explains the trailer's description, "the player flies in a spherical world surrounded by water, where gravity falls away from the center. Take the role of an unnamed cartographer to explore the various bubble-worlds, collect relics, and encounter each bubble’s unique patron deity, in order to discover more about the universe, its history, and its future." Lest anyone is tempted to grab their "Not A Game" placard, you can use guns to open new paths through the destructible scenery. Navigating obstacles will also be important—with your craft utilising stalls and air-brakes to manoeuvre through the environment. InnerSpace is due out summer next year. You can find more details on the game's IndieDB page.